Read about director Ben Wallis’ personal experience of a shooting mission with cameraman Justin Maguire for the four-part production ‘Wild Canada’. It took myself and Justin 11 hours just to drive to the location. We had to get through the Coquihalla Highway – often referred to as “the highway through hell” – just to get there. And the highway lived up to its name, throwing rain and snow at us over 11 gruelling hours. It was a relief to get to the small town of Hinton, Alberta but the driving got no easier. With the help of a very dedicated scientist and two 4×4’s, we entered the snowy mountains which are home to the magnificent Bighorn Sheep. Our mission was to film the male’s titanic battles. 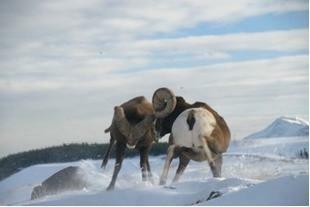 Their horn clashes are so severe, we were told that we would hear the impacts echoing around the mountains. We were not disappointed. The fights mainly involve two sheep and it’s a strangely mesmeric experience to watch. Having stared each other down, they turn and walk away from each other. Just as you think nothing is going to happen, the animals turn and face each other again. Rearing up on their hind legs, they “walk” towards each other using just their back legs and then bring their heads and horns together in what seems, sounds and feels like sickening blows. The animals speed at impact is thought to be over 15mph and battles between two individuals can last 20 hours! Over the next 10 days, standing in temperatures of -28C and testing our 4×4 driving to the limit, we got extraordinarily close to these magnificent creatures at the peak of their powers. The animals were so used to the scientist we were with that this is the closest I have been to a truly wild animal. And when this animal is demonstrating behaviour – especially of this brutal and powerful kind – its leaves a very strong impression that I will remember for a very long time. 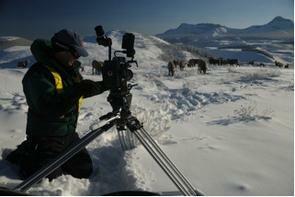 A trailer, more images and synopsis for the production can be found by following this link to ‘Wild Canada’.